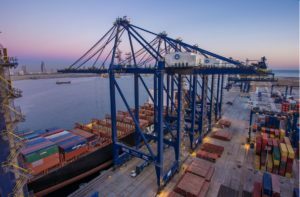 Hutchison Ports Pakistan, the country’s first deep-water container terminal, has set a new vessel handling record for the port of Karachi, having handled 5,862 moves in just over 27 hours while servicing the 8,652 TEU Hyundai Brave. During the vessel’s stay, the terminal achieved a vessel operating rate of 212.16 container moves per hour and a gross crane rate of 35 moves per hour, informs Pakistan’s Daily Times. Hutchison Ports Pakistan, a member of Hutchison Ports, is the country’s most high-tech container facility. Located within the Port of Karachi, a natural deep-water harbor west of the Indus Delta on the Arabian Sea, it offers a convenient access for containerships and is the only terminal in Pakistan that is capable today of berthing the world’s largest vessels. The terminal boasts 4 berths with a total length of 1,500m and a draft of 16m. The vessels are handled by 8 STS cranes, which will be doubled at full development. When fully completed, the terminal’s annual capacity will reach 3.2 mln TEU. The terminal started test operations just about 2 years ago, on 9 December 2016, and has been raising the national port productivity ever since. Today, Hutchison Ports Pakistan holds the current national vessel handling record, achieving 2,683 moves in just over 13 hours on the 8,562 TEU vessel Hyundai Courage in September last year. During the vessel’s stay, the terminal achieved a productivity of 203.4 container moves per hour and a gross crane rate of 32.3.